plant based detroit. 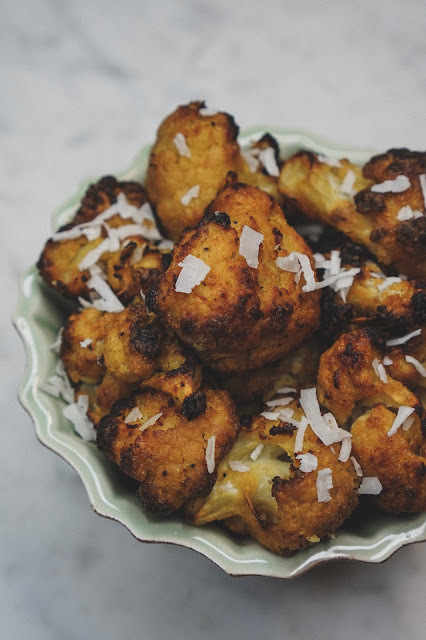 : OMNIVORE CHALLENGE: CAULIFLOWER COCONUT "SHRIMP"
Ok, I cannot lie to you guys. This recipe was totally a happy accident. 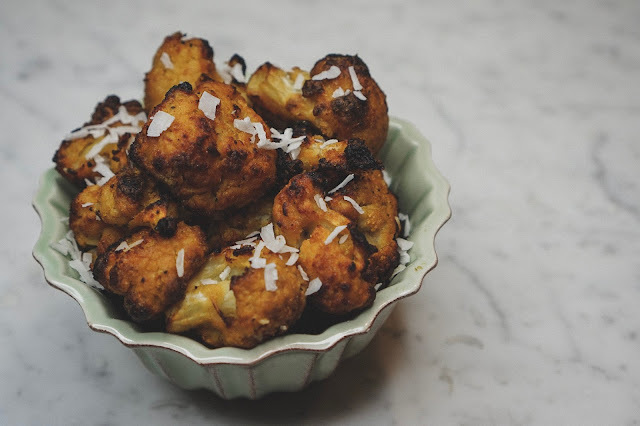 I had the goal of making cauliflower "wings" and they wound up tasting exactly like coconut shrimp...well, minus the shrimp of course! Because I used my air fryer, and the entire recipe only contains 1 tablespoon of coconut oil, these are a really healthy, low fat (but still super satisfying), and of course, plant based alternative to traditional coconut shrimp. To create the glaze I used the Pineapple Lime Hot Sauce (warning, it is VERY spicy) from my favorite, Bema and Pa''s - they make the best infused vinegars, salt free spice mixes and sauces! Preheat your airfryer to 400 degrees (I use the Breville Smart Oven Air) - if using a conventional oven, heat to 425. To prepare batter, place all dry ingredients in a large bowl, whisking to remove any lumps. Slowly whisk in almond milk. Batter should be thick enough to stick to the cauliflower, but thin enough to cook through - think thin pancake batter. Add water as necessary to reach this consistency. Add cauliflower to the bowl and toss with your hands to coat evenly with the batter. Place the florets (allow access batter to drip off first) on your air fryer sheet, or a baking sheet lined with parchment paper or a silpat. Bake for 20-25 minutes, until golden brown crispy. While the cauliflower bakes, prepare the glaze by mixing all the ingredients together. To make these extra coconutty, feel free to add some shredded coconut right to the glaze! After the cauliflower has baked for the first 25 minutes, remove from the over and gentle toss in the glaze, a few pieces at a time. Place the glazed florets back onto the baking sheet and bake for another 20 minutes. Keep an eye on them, as there is sugar in the glaze and burning is a possible! If you think they're browning too quickly, turn down the temperature of your oven slightly. Remove from the oven, and sprinkle the florets with coconut flakes. Allow to cool slightly, then enjoy!